CWC Various Post Exam Date Check Here. CWC Notification is out. 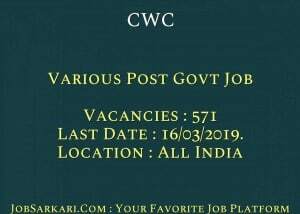 CWC is recruiting for 571 Various Post Govt Job Posts. You can check CWC - Central Warehousing Corporation last date, download CWC notification, visit CWC official website and check other CWC Vacancy details.Complete Vacancy and recruitment Details about 571 Various Post Govt Job vacancies in CWC are provided below by JobSarkari.Com only for you. Last Date of Apply Online. 16/03/2019. Last Date of Pay Application Fee. 16/03/2019. Mode of Payment. Candidate Need to Pay Application Fee Through Online Mode. Candidate Need to Pay Application Fee Through Online Mode. Management Trainee (General) Candidate Must Have Passed Degree with 1st Class Master of Business Administration, Specialization in Personnel Management or Human Resource or Industrial Relation or Marketing Management or Supply Chain Management. Maximum 28 Years. 30. Management Trainee (Technical) Candidate Must Have Passed First Class Post Graduate Degree in Agriculture with Entomology or MicroBiology or Bio-Chemistry OR 1st Class Post Graduate in Bio-Chemistry OR Zoology with Entomology from Recognized University/ Institution. Preference Will Be Given to Those Who Also Possess Post Graduate Diploma in Warehousing and Cold Chain Management/ Quality Management. Maximum 28 Years. 01. Assistant Engineer (Civil) Candidate Must Have Passed Degree in Civil Engineering. Maximum 30 Years. 18. Assistant Engineer (Electrical) Candidate Must Have Passed Degree in Civil Engineering. Maximum 30 Years. 10. Accountant Candidate Must Have Passed B.Com or BA (Commerce) or Chartered Accountant or Costs and Works Accountants or SAS Accountants of the Indian Audit and Accounts Department with About 03 Years’ Experience in Maintaining and auditing of Accounts in Industrial / Commercial /Departmental Undertakings. Maximum 30 Years. 28. Superintendent (General) Candidate Must Have Passed Post Graduate Degree in any Discipline. Maximum 30 Years. 88. Junior Superintendent Candidate Must Have Passed Degree in any Discipline. Maximum 30 Years. 155. Hindi Translator Candidate Must Have Passed Master’s Degree of a in Hindi/English with English/Hindi as a main subject at the Degree Level. Candidate Must Have Passed Bachelor’s Degree with Hindi and English as Main Subject or Either of the two as Medium of Examination and other as a Main Subject Plus Recognised Diploma/Certificate Course in Translation From Hindi to English and Vice Versa or 02 Years Experience of Translation Work from Hindi to English. Maximum 28 Years. 03.
as one of the Subjects. Maximum 28 Years. 238. Total No. of Post 571. 3. Candidate Are Required to Fill All The Details And Have to Upload All The Mandatory Documents Like Education Certificate, Caste Certificate And Age Proof As Mentioned in Notification. 4. Candidate Need to Apply Online Before 16th March 2019. Q. What is the Last Date For CWC Various Post Govt Job Vacancy ? A. 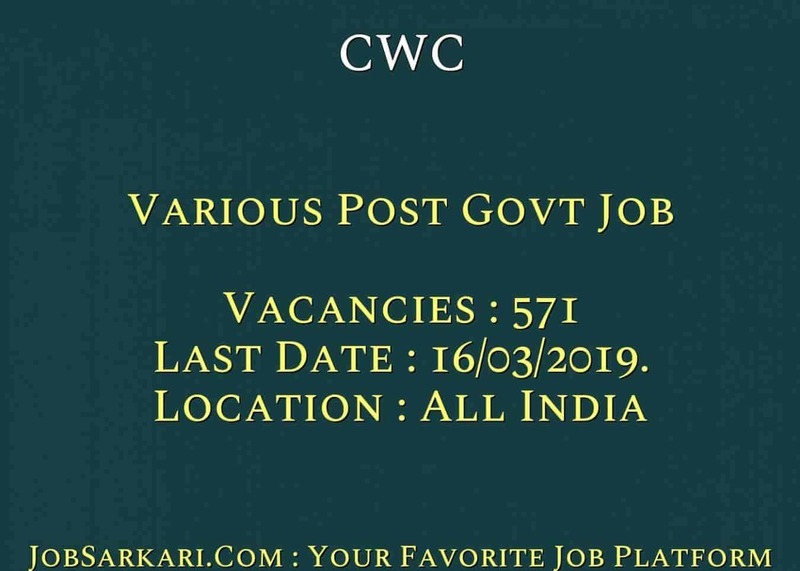 Last Date for CWC Various Post Govt Job Posts is 16/03/2019..
Q. What is the Form Type of CWC Various Post Govt Job Recruitment ? A. The Form Type for CWC Various Post Govt Job Posts is Online. Q. How many vacancies are available in Central Warehousing Corporation Various Post Govt Job Posts ? A. There are about 600 Vacancies in Central Warehousing Corporation Various Post Govt Job Posts. Q. What is the Full Form of CWC ? A. Full Form of CWC is Central Warehousing Corporation . Aap is Link Se Sabhi Sarkari Naukri ke Liye Apply Kar Sakte Hai..